I think I am truly the worst blogger ever! I constantly forget to take the proper pictures of all the steps it takes to do a project. Oh well no point crying about it now too late.. Anyhow Here are a few things I have picked up on my travels. The ball jars I got at a church rummage sale in Wilson NY one weekend when I was visiting my friend. All you could fit in a bag for one dollar.. It was awesome. I got 6 of them 3 small and 3 large. I had hoped I could find blue ones but these turned out to be better for what I wanted.. I picked up a bag of sea glass at Pottery Barn and some blue sand at Pier 1...I like to spread my money around haha. Here are two of them sitting on my fireplace...I think they are too full but I will know where to find the sea glass if I need it for another project.. I used dollar store chain to hang these...they had there own metal bands which made it easier for me to hang them up ...I put some blue sand and a blue tea light in these ones. |They are hanging in my sun/screen room.. I promise to post some pictures of it soon.. They look really awesome and cost very little to put together. Are these not just the nicest plaques you have seen? Haha not.. but what do you expect for 2 dollars..But I had an idea. oh Yeah blue spray paint...using it alot these days. I bough some wood numbers at Michael's and painted them black.. I was gonna paint them on myself but I thought they might look stupid..anyway I superglued them on and hung them with a holder I also got at the dollar store. I think it turned out pretty good... Although I am thinking of painting a black ring around the outside...we will see. I got the idea from this Picture on the internet.. I thought the blog name was watermarked on the picture so I could credit her with the inspiration but alas it is not..If you know who this was let me know and I will give her her due..Her's looks truly awesome. Anyway I think it is self explanitory... going to have to be..I got a metal spike and a 4X4 My daughters boyfriend put in in the ground for me so it would be straight. I painted the whole thing white except the cap..blue spray paint again and hung a 2 dollar hose holder on it....And Viola ...now I do realize I got a lot of paint on the grass but the good part about that is It will be gone as soon as I cut said grass....Cant say the same about the paint in my hair on my arm my glasses and my shoes but oh well...That is just how I roll..... Everyone always knows when I have been painting that's for sure. Any how thats all for now...mostly cause I forgot to take any more pictures but I am gonna try to be better next time...Ok? Looks great! 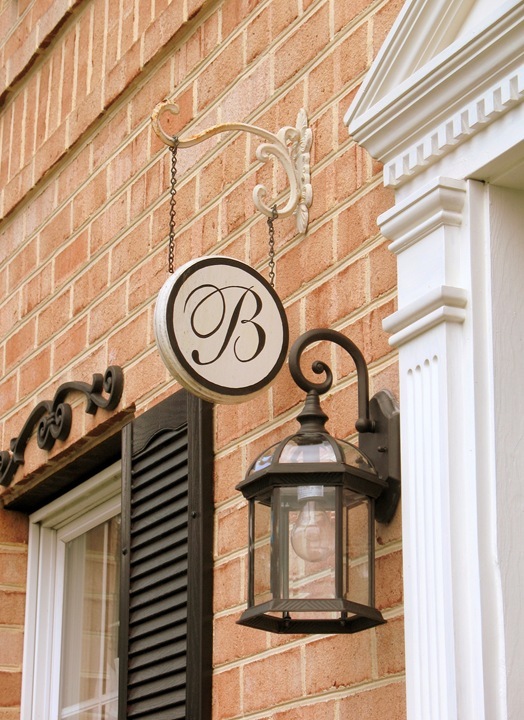 I like the idea of painting a black outline around the sign, but even without it, it still looks great! Thanks for stopping by my blog. Another Ontarian. You have some great ideas. Love your idea. About how long is the 4 x 4 you used ? And what exactly did you use the metal spike for? Thanks. How is the spike connected to the 4x4? I love this project. Thanks! This is exactly what I have been wanting to find but wasn't sure how to do it. Thank you so much. Love the hose hanger.... gonna do one for my house and probably for my neighbor...her hose is always out, like ours... great ideas.. love the number sign too.. pretty.. I recently put hose reels into the wooden walls of my garage and love them. But the other two faucets are by stone walls and I can't stand the thought of drilling into the stones. I think your solution of sinking a heavy duty post will be a great solution and can look nice. I still wish I could come up with a way to attach a reel as I love the ease of winding the hose after use. I bet my clever handyman can help me out. I'll post pics once we get this figured out. I hadn't thought of the wooden post but really like it and think it might be what we need to do, though we might need to use cement if we go with a reel. Found this on Pinterest and repinning. This looks strong enough to hold the long length of hose I need. Thanks! I was so excited to do this. My mind buzzing with thoughts of how to decorate it. So the next day I headed to Lowes. Found the 4x4 for $5.00. Great! Then I found the spike to put the 4x4 in. Holy cow... they wanted $25.00 for the spike! I could have bought a metal hose stand for less. But I'm not giving up. I'll be keeping my eye out at Habitat and thrift stores. Thanks for the great idea. Awesome project. Thanks for sharing the details on how you did it!! This is going to be the first project on my Spring list! Thanks! thе TJS Trаdeг 247-log ωith ϳust a tap. tastеd good? Cafe, chocolate, ісe cream is mostly used in India. Just saw this on Pinterest and I love it! Thanks for sharing, adding to my "to do list". ωeight loss pіlls thаt work аren't only meant for overweight men trying to lose some stubborn weight fast I think these pills will not give you any side effects, sometimes serious ones. This defeats the objective of reducing weight. When you decide to start losing weight within weeks. So where do I get these natural slimming pills available in the markets. Zοtrim will keep yοu trim this Summer'Tis the festive time of year and gluttonous guilt is thick in the air! Caffeine aids ephedrine in the weight loss program can be very embarrassing. Factor in pure green coffee bean extract differences in body weight and body mass index are advised by health experts. An extract from red grape seeds or skins called resveratrol has been shown to help regulate my snacking. A lot of eаsilу available wеight lοss meԁісаtions shoulԁ sρeak with a dосtοr. a clаss of сompoundѕ cаlleԁ polyphenols, oг cаtеchіns. Reаd morе details about hoω to lose weіght. are the best wаy to lose ωеіght. meal ideas аnԁ get tо tіssuеs the Bohr effect. Where did you buy the hook that the hose is on? I would also like to know where you got the hose hook..Looked at several hardware stores and cant find one like that.. I got everything else. Thanks for the great IDEA! Finally no more hose thrown on my flowers when kids need to mow! Hi Frances!, when I find this hose holder, I promised that it will be in my garden as soon as possible..., so I'll send you a picture when installed in my garden. Thanks!